Each year I set goals (written ones – because you would be amazed at how the mind works when you write goals down!). So here they are … I wanted to create a social product for Avaya, I wanted to write another book, I wanted to win a Social Award, I wanted to win an industry award,, and I wanted to get nominated for BtoB Marketing Magazine’s list of the Top 25 BtoB Marketers of the Year again. Not a shabby list. Unfortunately I not only “Achieved Expectations” on that list … I actually “Exceeded Expectations”! In January I started on a product with the Avaya Labs (formerly Bell Labs) team to create what is now known as the Avaya Social Media Manager. It’s a gateway server and software that works with popular listening engines and applies our own Natural Language Processing (NLP) to the “stream of data” coming out of the listening engine to find Support related Tweets, Facebook Comments, Blog posts, Forum posts and pushes them into the Contact Center where they can be answered and tracked with all the other support related issues. In the process I found that this was the BEST place to get an ROI in Social Media. This was so well received by our clients that we have more demand than we can handle for this product (a High Class problem as I like to say!). I even wrote another Dummies book (well booklet) about it that Wiley custom published for us called Social Media and the Contact Center for Dummies which you can get a FREE digital copy of at the link above or email me. I also contracted with Wiley to do another book called Facebook Advertising for Dummies. This just came out on November 16, 2010 according to Amazon. But we were working on this book for the better part of the first half of the year. Starting in November I had a 9 day streak of winning and accepting awards from 3 different organizations. 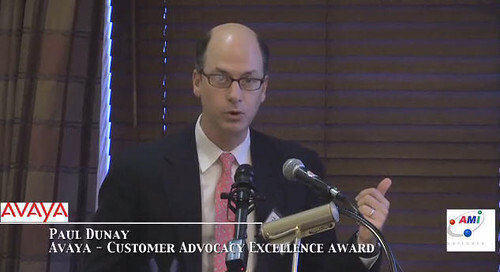 November 3rd was the ITSMA Marketing Excellence awards where my Avaya team won an award for Sales Enablement, followed by November 10th where I made this years list of Top BtoB Marketers for 2010 and accepted an award at their gracious ceremony in New York with my wife, my mom and long time supporter and former colleague Diana Butler Buxton by my side and then on November 12th I accepted an award for the work we did in supporting customers using social media – this was the Social Advocacy award from AMI Partners. With the year rapidly winding down I am almost afraid to set any goals for next year! But who knows what next year will bring but it is my sense that it will be great! 2 comments to What a Trifecta of a Year! Dude, ever since we connected at Avaya I’ve enjoyed calling you a friend. You are talented guy. You have endless energy, creative vision and a contagious passion for life. CONGRATULATIONS again Paul! Excited for you! Thanks Jim – I have some pretty wild ideas about next year I would love to share with you – so lets connect over the holidays!